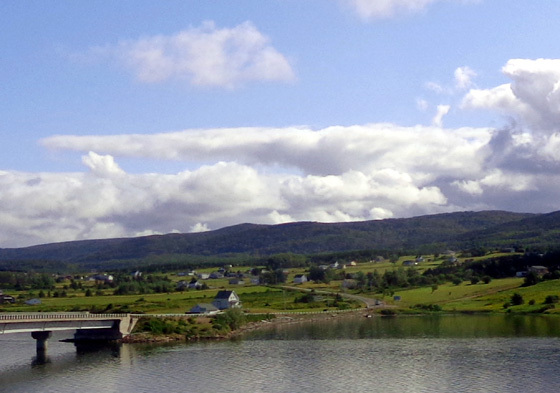 that offers spectacular coastal views, highland scenery, and warm Celtic hospitality." 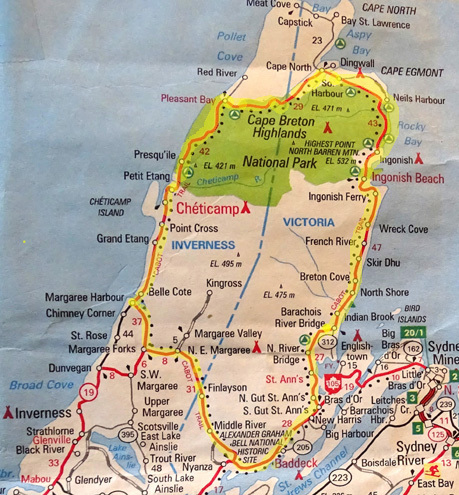 One of the main reasons I wanted to spend some time on Cape Breton Island was to drive the long loop around the northern half of the island. 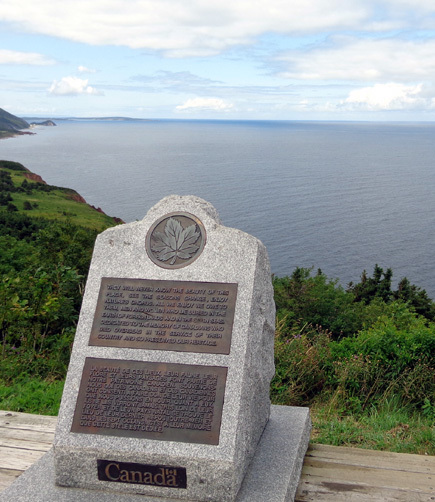 The Cabot Trail is named for John Cabot, who was reportedly the first European explorer to reach the Atlantic coast of Canada in 1497. 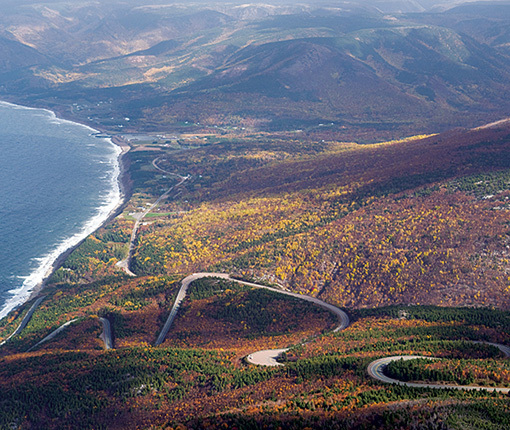 The Cabot Trail undulates above the Gulf of St. Lawrence on the western side of the island. 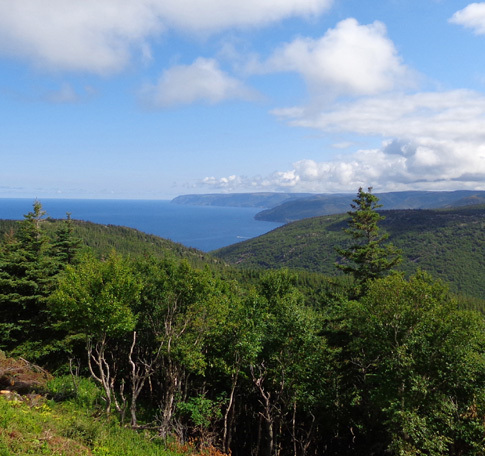 We'd read about the spectacular scenery along the rugged coasts on the eastern and western sides of the island, through the mountains ( highlands) of the national park, and past the fertile Margaree River valley and beautiful Bras d'Or Lake. The scenery was all we expected from the tourism hype -- and more. Pink quartz rocks contrast with the brilliant blue water at Green Cove on the Atlantic side of the island. We can highly recommend that other visitors do this drive. 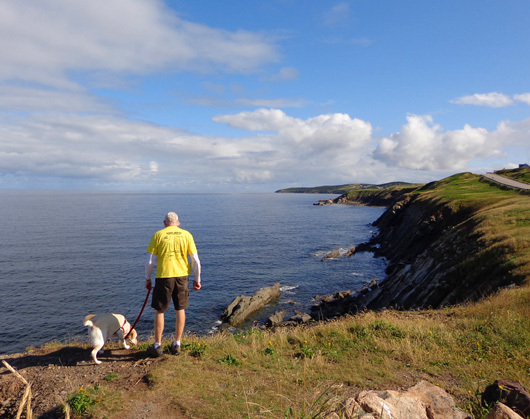 We did the whole loop clockwise in one day, returning to our base at the Baddeck Cabot Trail CG in the late afternoon. That allowed time to get out at several overlooks, stop at the national park visitor center, eat lunch, and take a short walk -- but it wasn't long enough for a real hike. 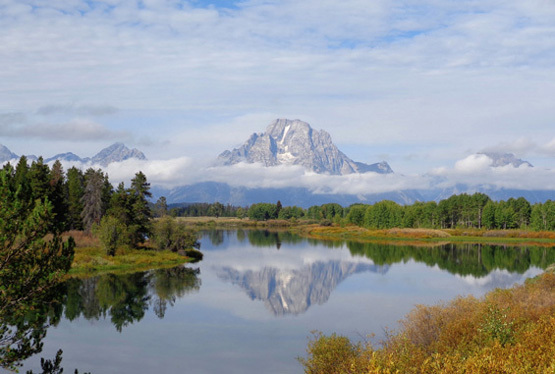 Some people spend several days on the loop, staying overnight in campgrounds, cottages, B&Bs, or other accommodations. 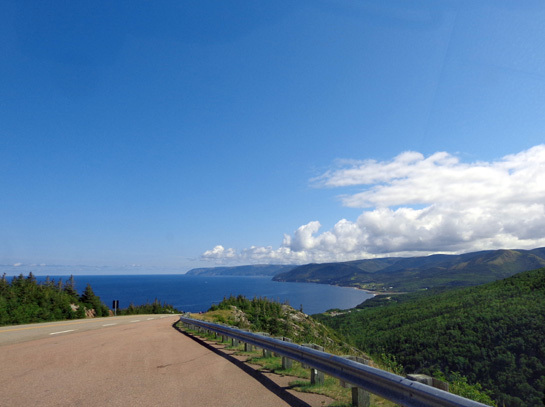 It's a long drive around the northern half of Cape Breton but well worth the time and energy. 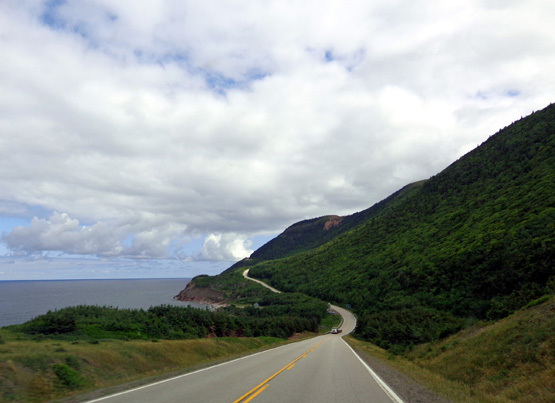 We did the Cabot Trail in a clockwise loop. 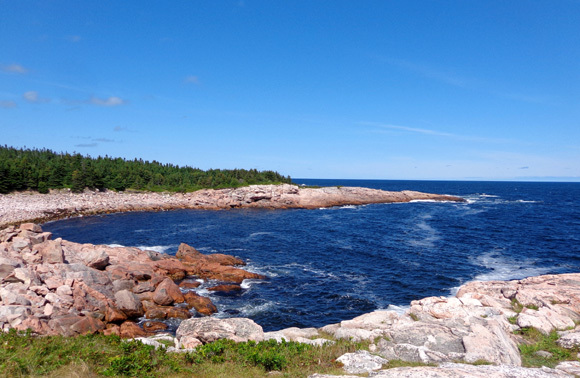 We stopped at lots of overlooks so we could see the 180- to 360-degree views from up to 1,475 feet above the Atlantic Ocean and Gulf of St. Lawrence . . . and right down close to the shoreline. Most of the views are simply awesome. 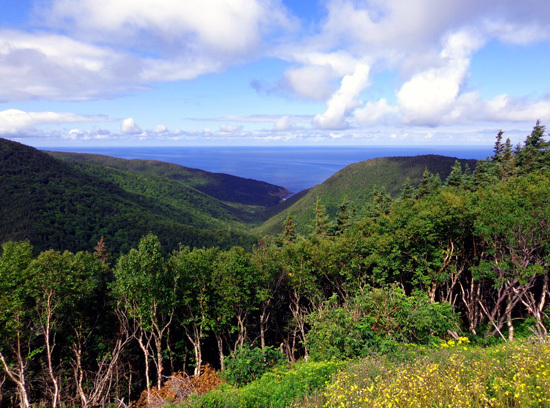 and high above it in Cape Breton Highlands National Park. 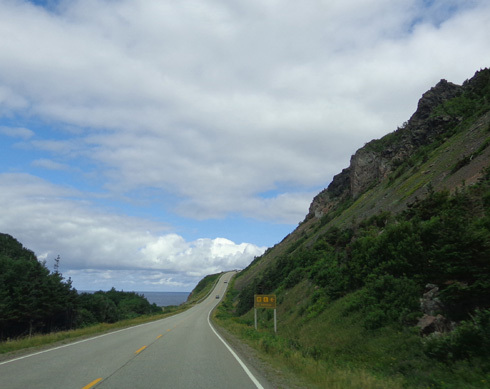 The terrain along the Cabot Trail is beautiful, ranging from rugged coastlines to canyons full of maple trees to sub-arctic boreal and arctic taiga habitats similar to those we saw at high latitudes in western Canada and Alaska. We went from a latitude of 46.09 degrees in Baddeck to 46.88 degrees at Cape North, the farthest north we got today. In comparison, Fairbanks, AK is 64.8 degrees -- much farther north. 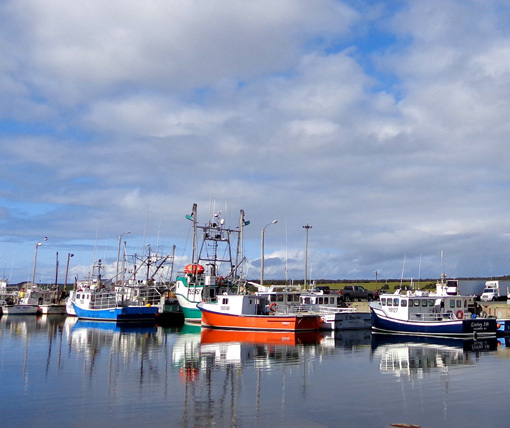 Yet the average temperatures in Fairbanks, which is inland, are warmer in the summer than Cape North, Nova Scotia, since the island is subject to more fierce weather from the ocean. The whole island has a cool, maritime climate. Location, location, location . . . Wouldn't this be an idyllic place to live (in the summer)?? 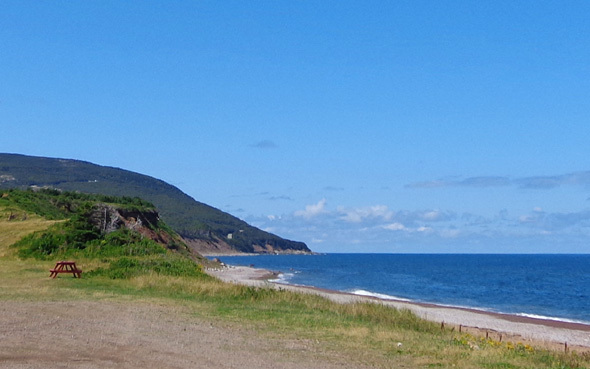 It's on the western coast of Cape Breton Island north of Margaree Harbour. 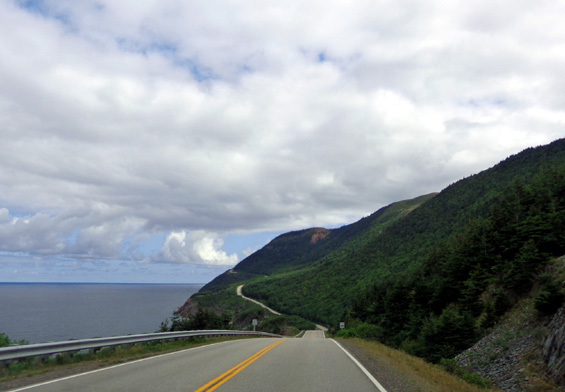 We enjoyed the drive through Cape Breton Highlands NP the most, with gorgeous views of the Gulf of St. Lawrence in the morning to the west and the Atlantic Ocean in the afternoon to the west. If we ever come up here again, we should do a CCW loop to see the scenery from a different angle. We left the campground near Baddeck about 8:30 AM and returned about 4:30 PM with lots of stops but not much hiking. Jim was hoping to find a good place to return tomorrow to ride his bike. 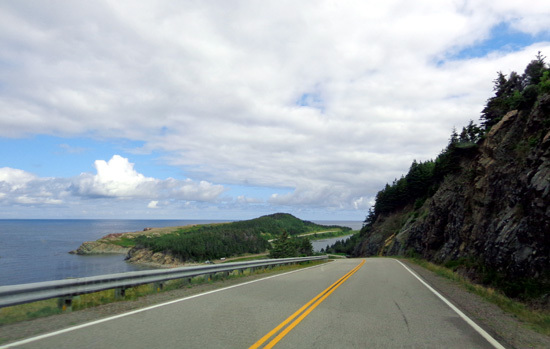 Although we saw lots of cyclists on the Cabot Trail and the promotional websites and literature say it's a great place to ride a bike, we aren't so sure. 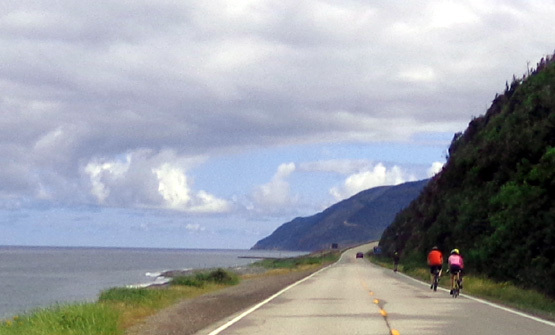 There is a lot of traffic in the summer, even on a weekday, and few to no shoulders to ride safely. 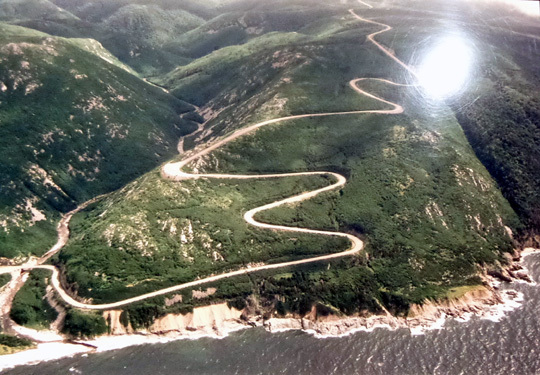 If you're determined to ride the Cabot Trail on a bicycle despite the risk to your safety, and you're fit enough to manage the mountainous terrain, go for it! It would definitely be a ride to remember. 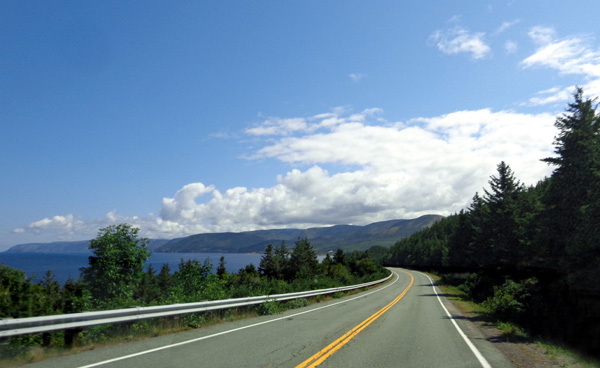 Baddeck is at the south central point of the Cabot Trail loop. 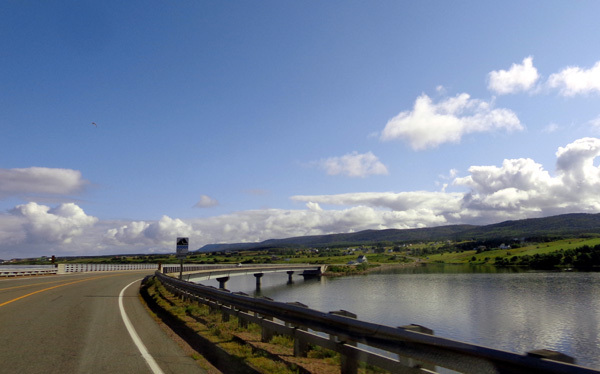 From our campground we drove west and north past the multiple Middle River and Margaree communities. As in New England, several nearby towns have nearly the same name -- Margaree Forks, Upper Margaree, SW Margaree, NE Margaree, Margaree Valley, etc. 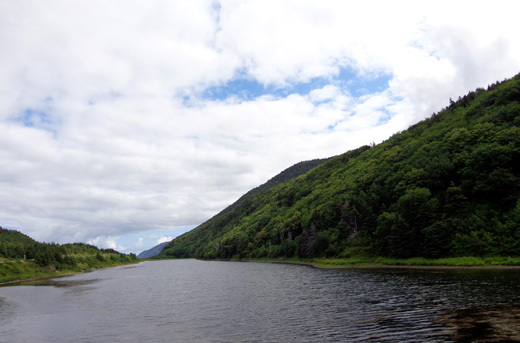 The Margaree Valley is renowned for its salmon. 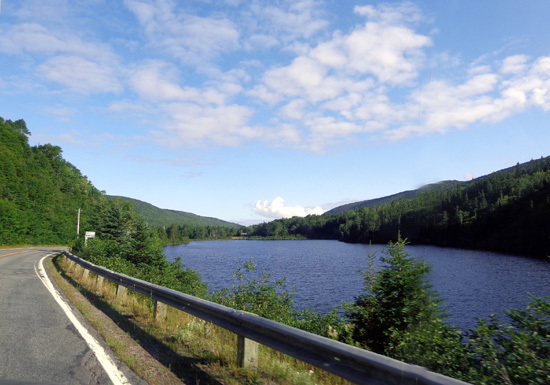 There are numerous creeks, rivers, lakes, and wetlands in northern Cape Breton Island. Most of the interior of this area is wilderness, with no roads or even trails bisecting it. We saw lots of signs for moose but didn't see any of the critters in person. There are also bears and coyotes in the area. 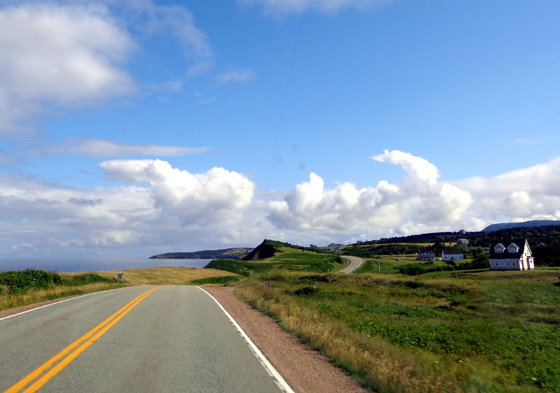 We followed the beautiful coastline for about sixteen miles to the town of Cheticamp, which lies on the southwest corner of Cape Breton Highlands NP. Jim and Casey peer over the cliff above the Gulf of St. Lawrence soon after we reached the coast. 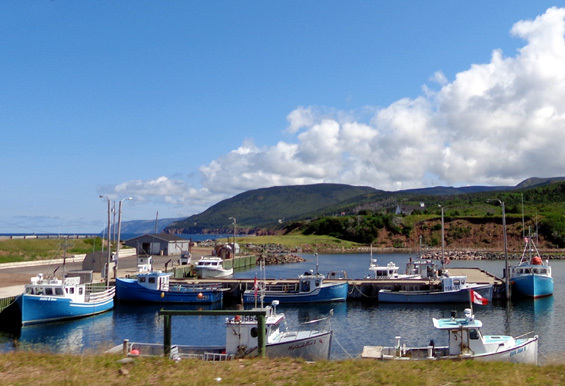 We had two goals in Cheticamp -- to find a restaurant where we could get something for lunch (a problem, since it was only 9:30 AM) and to check out the Acadian museum that features rug-hooking, spinning, and weaving. We didn't get anything for lunch that early. I did go into the museum to look at its interesting displays. 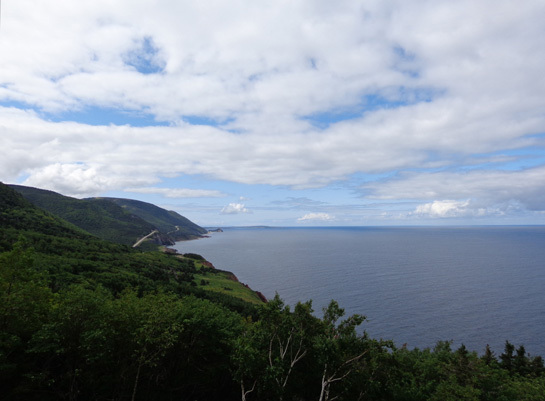 WE LOVED CAPE BRETON HIGHLANDS NATIONAL PARK!! 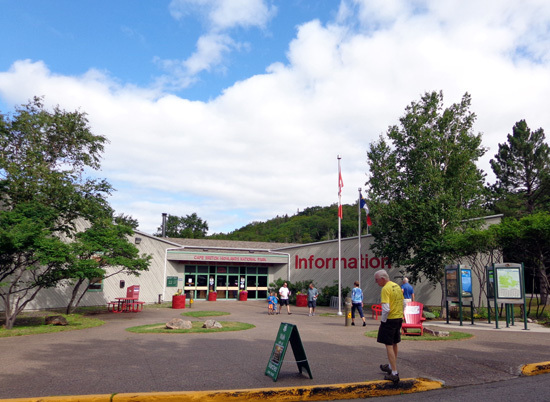 At the western entrance to Cape Breton Highlands NP we went into the visitor center to get a detailed park map and pay our entry fee. At some Canadian parks you don't have to pay if you're just passing through (e.g., Fundy NP). Here, you have to pay unless you live north of the park. We got day passes for $6.80 CA each (senior rate). They are good until 4 PM tomorrow if we decide to go back. There's a five-mile trail** I'd like to do but it's not worth such a long drive to get there. 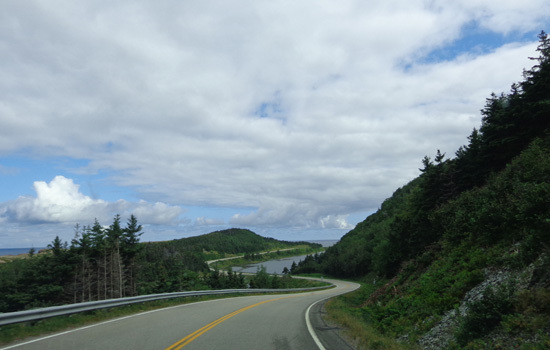 Did I mention all the hills on the Cabot Trail?? It's a fun roller-coaster ride in a passenger vehicle. 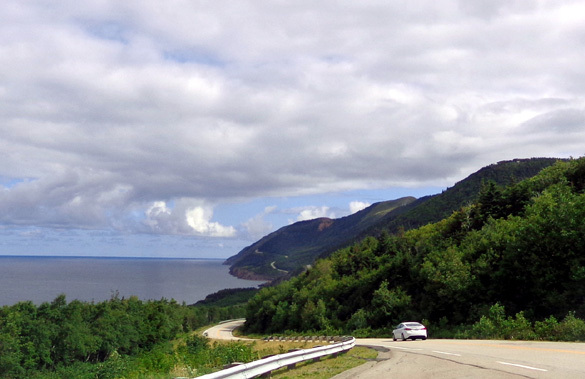 One-third of the Cabot Trail goes through the national park. The road surfaces on the whole loop were the best in the park. Where the highway goes through other areas, it was often very rough. We were glad we weren't pulling the Cameo today! The worst pavement is on the eastern side of the loop, south of the park, one reason we preferred the western side of the loop. We stopped at numerous overlooks to scan the views and take pictures. We never got tired of looking at the beautiful mountains or the water. Much of the terrain and flora reminded us of British Columbia, the Yukon, and Alaska.